It's easy to be skeptical of City on Our Knees (Bethany House, 2010). For starters, there are plenty of Christian books with promises of a hip, new gospel experience stamped across their shiny covers, and more often than not, they turn out boring. Another thing to consider is that the book's author is singer/songwriter tobyMac, which raises the question: "Can a singer really write a book?" For those of you who want your suspicions appeased, I encourage you to crack open a copy of City on Our Knees. Sure enough you'll find it's not only a good book, it's a great book. The best thing about City on our Knees is that it delivers something many Christians, particularly younger ones, are in desperate need of: good role models. The vast majority of the book is dedicated to short biographies of Christian individuals who have striven to inspire others through their faith. While this is certainly nothing new to the Christian genre, tobyMac's clever design makes it far more effective then your average devotional. The stories range from historical movements to personal experiences, and feature a cast of missionaries, teenagers, athletes, and everyone-in-between. Each testimony is unique, but all resonate within a single theme: Christian believers need to step out and act on their faith. Sure, not all the narratives will move your spiritual mountain. The book's story of Michael Oher, for example, may not carry the same magic it did in the cinematic blockbuster The Blind Side. Still, other stories proved touching and incredibly raw. In particular, the account of one pastor's mission to rescue the teenaged prostitutes of Thailand will leave you in shock. There are a few moments when the stories feel overblown (odds are you won't be a fan of every one), but the artistic diversity of City on Our Knees ensures that there's something for everyone. The book is also very aesthetically pleasing. Pages are decorated with quotes from famous theologians and social activists. Verses from the book of Psalms make regular appearances, and the prayers of saints can be found at the end of certain sections. Personal letters from the book's author also add a note of encouragement to the reading. It's clear tobyMac wasn't looking to write an instruction manual for Christians, but instead strove to build connections between himself and his readers. City on Our Knees is less effective as casual reading, more effective if used as a daily devotional. Pound the pages too quickly, and you'll get bogged down and miss the message. Take it one chapter a day and you'll have time to truly savor what the book has to offer. Knowledge of tobyMac's music is also recommended, though not required. Occasionally he'll refer to a song as an example, and it's nice when you recognize which one he's talking about. 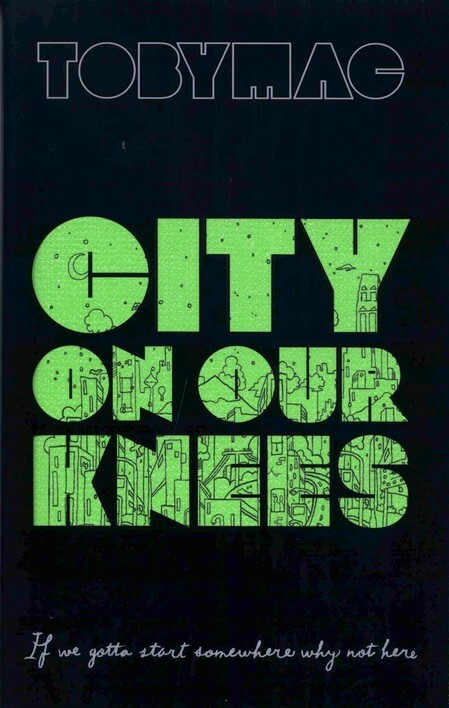 When asked to describe what City on Our Knees (subtitle: "If You Gotta Start Somewhere, Why Not Here") was about, tobyMac responded, "City is about a moment, a moment that we all come together, and our differences fall by the wayside, and love fills in the cracks, and we turn our attention on what unites us." Whether you are looking to share in this moment, or simply want to find a new book to occupy your time, it's worth it to step across the line and experience the life of City on Our Knees.